YouTube descriptions are one of the underrated nuggets of the SEO world. If you’re creating YouTube videos, it’s easy to spend all your focus on lighting, sound, script, and overall content. After all, it’s a YouTube video. If you’re going to create high quality vide content, these things are a big deal. But what if you do all these things right? You write a killer script, light it up, mic it just right so your audio can be heard, fine tune the costuming, mix and master the audio, edit in post production, and post that incredible video to YouTube. And then you wait. Here’s the thing – people don’t know what they don’t know. They don’t know they should be looking for you … unless you get in their heads and tell them so. Or you answer a question they’re searching for. Or they discover you while they were looking for something else. They find you while searching – not for you (unless they know your name specifically) but instead for content. Are you posting videos about art tips? Your title and description better say so. Are you posting recipes and walking your viewers through how to make sad recipe? Your description better let users know. One of the most common myths in the online world is the idea mentioned in Field of Dreams… If you build it, they will come. This isn’t entirely true in the digital marketing world. Instead, we have to describe to people the answers they’re searching for. And today’s example is YouTube descriptions! 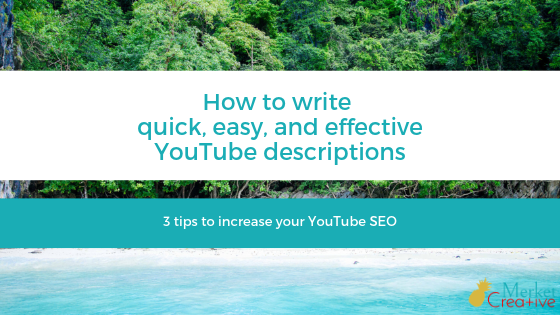 Here are three ways to write quick, easy, and effective YouTube descriptions. As google’s algorithms get smarter, it becomes less easy to “hack” copy. The easiest way to overcome this is to not try to “hack” anything. Just write for people. Write the way you talk, the way you would explain it to a friend. Your YouTube descriptions should follow this same principle. Now this doesn’t mean the first go around is the right go around. (After all, how many times have you said something, then thought I really should have phrased that this way!) Write it out, edit, tweak, and then read it out loud to make sure it flows naturally. 2. Pick (and properly use) 1-2 keywords. It’s important that you clearly identify what your video is about, but also that you don’t get carried away with keywords. Maybe your video is about how to make the perfect choux pastry. Your keyword may be just that: perfect choux pastry. You may also use something like “beginners” or “advanced” to identify who your content is geared towards. If you’re not quite sure what keywords to use, use a tool like google trends to discover what people are actually searching for – and don’t be afraid to use word-for-word searches. If you provide the answer, use the question to help people find you! Use the keywords in your video title and in the top of your YouTube description. Join us as we teach beginning pastry chefs how to make the perfect choux pastry. We’ll cover pastry tips, what can ruin a choux pastry, and how to form the choux pastry for cream puffs that will both impress and delight your friends and family. YouTube pretty quietly rolled out the ability for users to search by hashtags. While you definitely don’t want to get out of control. YouTube has very specific guidelines for hashtag usage, most of which are consistent with other social media platforms. However, one guideline is important to note: Do not use more than 15 hashtags per video. Using more than 15 hashtags will result in YouTube ignoring all your hashtags. Which tip is the most useful to you? Will you change the way you write your YouTube descriptions? Let us know in the comments below!